Spiddal, Co. Galway, Ireland; margins of pools. 29 Mar 2012. M.D. Guiry. © M.D. Guiry (mikeguiry@me.com). Chyandour, Cornwall; tetrasporangial plant. 10 Nov 2011. David Fenwick. © David Fenwick (davidfenwicksnr@googlemail.com). Gelidium ? 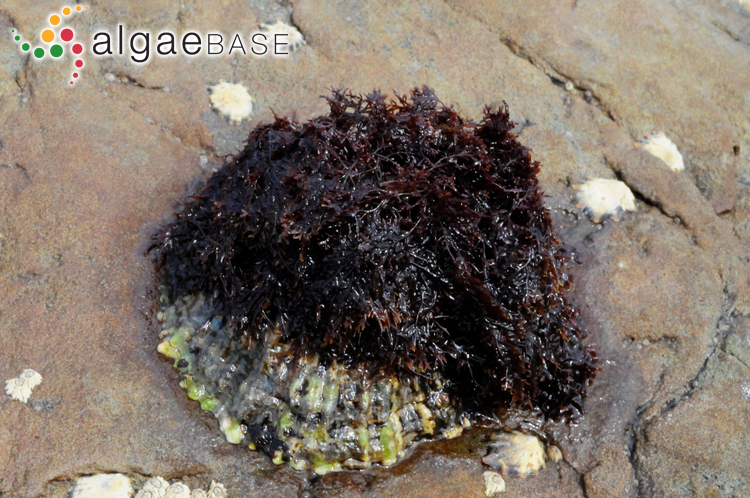 pulchellum on limpet, Spanish Point, Co. Clare, Ireland. 28 Aug 2010. M.D. Guiry. © Michael Guiry (mike.guiry@nuigalway.ie). 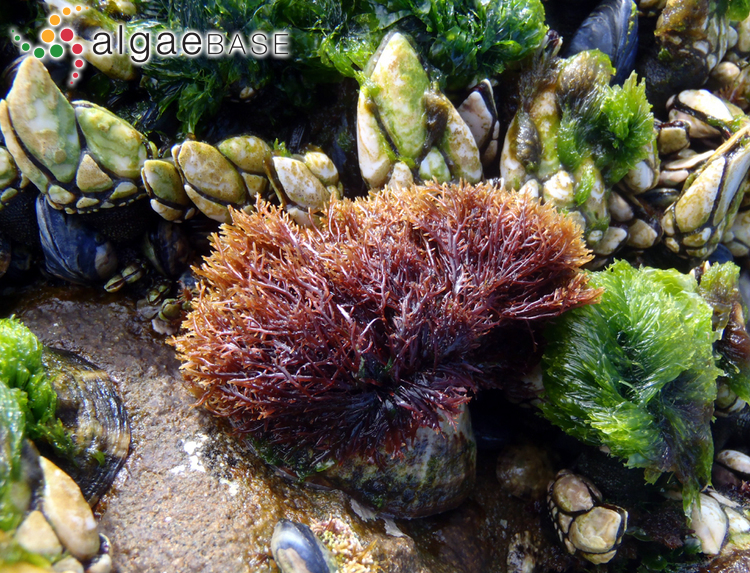 Gelidium pulchellum, Fountainstown, Co. Cork. 28 Aug 2010. M.D. Guiry" . © Michael Guiry (mike.guiry@nuigalway.ie). Spanish Point, Co. Clare, Ireland; late-summer plants in a rock-pool. 04 Aug 2004. Michael Guiry. © Michael Guiry (mike.guiry@nuigalway.ie). 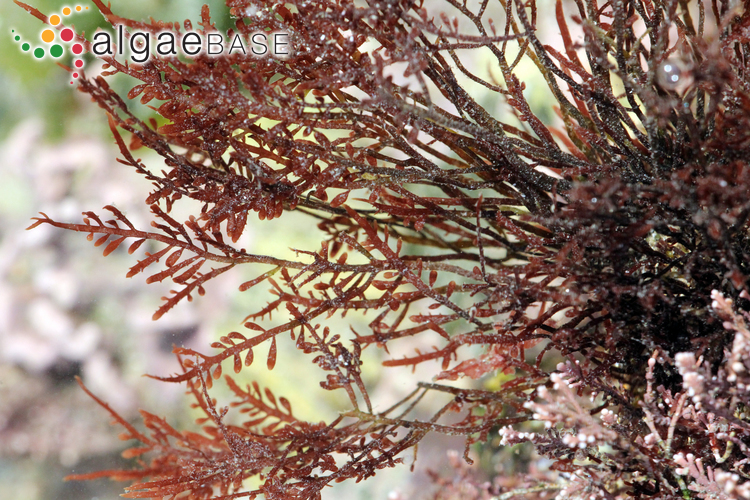 Cartilaginous, regularly or irregularly bipinnate, dark red-brown fronds, 50-100 mm high, arising from a creeping base. Main axes narrow, cylindrical, somewhat flattened above. Ultimate branches short, pointed at first, later ± spathulate, particularly when reproductive. Appearance variable with habitat and time of year. 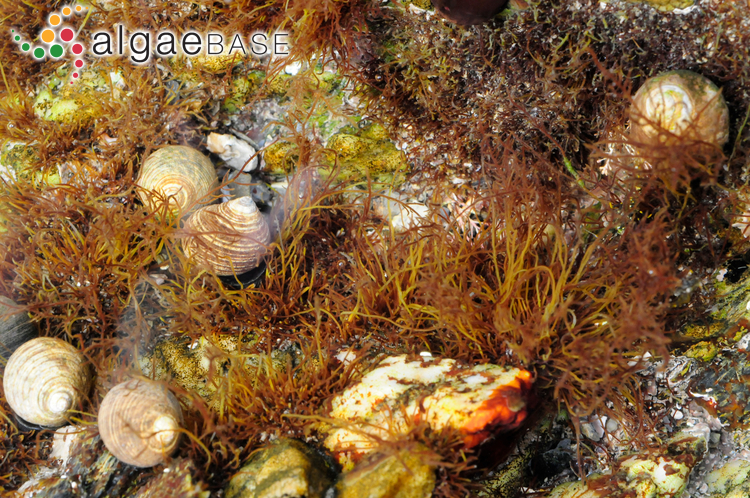 Abundant in and around tidal pools in mid- and lower intertidal in high-light situations. 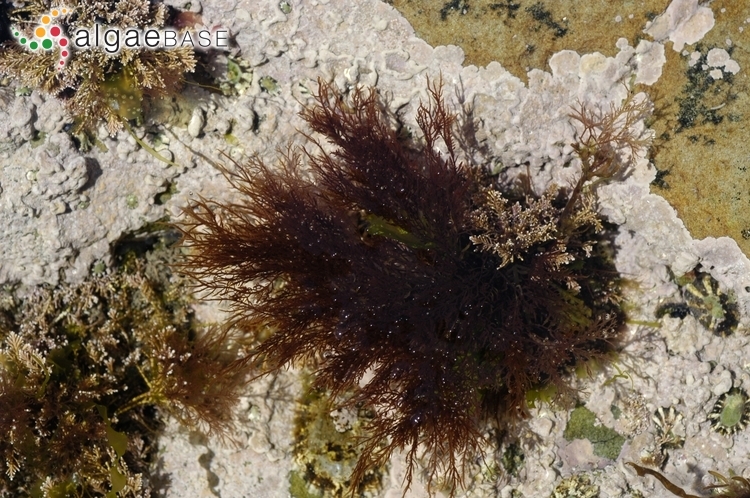 Generally epiphytic on Corallina officinalis. Widely distributed, common. Pinnate branching, mid- and lower-intertidal low-light habitats, and slighly flattened main axis. 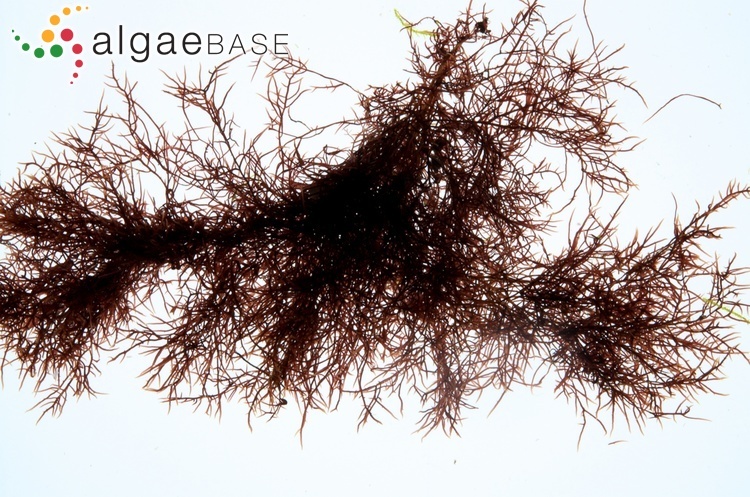 Gelidium latifolium is more flattened and more regularly pinnately branched and occurs in lower-shore habitats and in the subtidal. Feldmann, J. & Hamel, G. (1934). Observations sur quelques Gélidiacées. Revue Générale de Botanique 46: 528-549, 11 figs. Accesses: This record has been accessed by users 7739 times since it was created. Gómez, I., Figueroa, F.L., Sousa-Pinto, I., Viñegla, B., Pérez-Rodríquez, E., Maestre, C., Coelho, S., Felga, A. & Pereira, R. (2001). 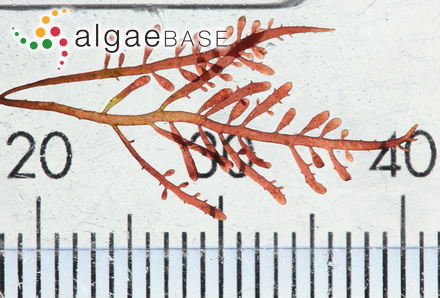 Effects of UV radiation and temperature on photosynthesis as measured by PAM flourescence in the red alga Gelidium pulchellum (Turner) Kützing. Botanica Marina 44: 9-16.